Digital marketing gurus and online leaders including Google, Yelp, Uber, Lenovo and Philips come together this March 15, 2019, at the eCOM360 conference, in Riga, Latvia, to share their expertise. RIGA, LATVIA / JANE WALSH / JANUARY 11, 2019 / The victory march of eCommerce has irreversibly transformed the global economic landscape and continues full-speed ahead, with billions of people buying and selling daily online. In tandem, digital marketing has taken the entrepreneurial world by storm. It is no secret that successful businesses focus their marketing efforts online, reaching out to ever-growing, captive online audiences. Yet, success is not at the hands of everyone. eCOM360 – a conference dedicated to eCommerce and its trends, taking place on March 15th, 2019 at the Radisson Blu Latvija hotel, in Riga, Latvia, focuses on the contrastive analysis of successful e- business practices across both the western and the eastern hemispheres. The conference brings together the world’s biggest online players, featuring the likes of Google, Yelp, Uber, Lenovo and Philips to name a few, along with renowned digital marketing experts eager to share their expertise and experiences. 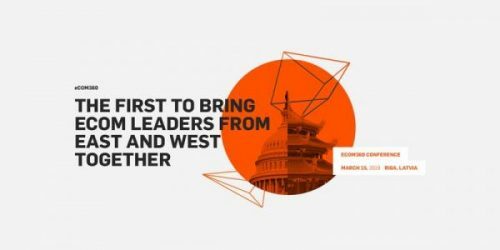 “The theme of the conference is the east meets the west,” says Glebs Vrevsky, eCOM360 chief organiser, “The idea is to learn from the similarities and differences between the two hemispheres, through the eyes of successful leaders within the eCommerce realm”. The development of eCommerce and digital marketing between the western and the eastern hemisphere is quite spectacular. The basis is the same between the two hemispheres and certainly the objectives are very similar; but due to the geographical locations, the multitude of cultures, religions and so forth, the business and marketing challenges faced by each hemisphere are worlds apart. Yet, both have succeeded in developing billion-dollar industries, of which eCOM360 key speakers are testimony. Concurrently, the differing developmental eCommerce environments are filled with marketing treasures under-explored and under-utilised by the opposing hemispheres. Consider this – recent data shows that as little as 10% of all online purchases made by Americans are on their mobile phones. This figure is expected to explode, reaching a predicted 53.9% over the next years, fundamentally reshaping America, and tangibly impacting western eCommerce practices. Meanwhile, China recorded 790 billion mobile payments back in 2016, outperforming the US 11x that year. In fact, mobile shopping is the most popular retail channel in China, surpassing even in-store purchases. While the scaling of mobile eCommerce in the US does not mirror China’s example, there are lessons to be learnt on everything from infrastructure to marketing at every level, that are just too valuable to at best – miss, or at worst – ignore. Understanding the global landscape is paramount. No longer are pivotal shifts measured in decades – the market is increasingly becoming more dynamic with game-changing innovations sprouting on a yearly basis and, while falling behind won’t necessarily impair your business in the short term; it will certainly do so in the long term, limiting your opportunity for growth. Businesses cannot afford to pass on the knowledge gained through trial and error by their eCommerce counterparts, especially when unique and valuable insights are offered on a silver platter at eCOM360. Ajit Sivadasan, VP/GM Global eCommerce at Lenovo, one of the speakers at eCOM360, will share Lenovo’s success story and how it grew from a small enterprise in China to a large multi-billion business by selling their products online in more than 100 countries. Another featured speaker is Rudi Anggono, Head of Creative + Strategic Visioning at Google, who will share his experience, talking about the reverberating impact and the importance of creative decisions, offering a comparative analysis of this impact in different geographical sectors. Guest participants from China, the EU SME Centre, will also hold a unique workshop about WeChat, one of China’s most active apps, to demonstrate how companies are using this app to market themselves in China. They will address the mind-blowing effect it has on businesses as a driving sales force, through engagement with WeChat users, the best ways to get the most out of WeChat and why it is working so well. eCOM360 is a must visit for everyone in eCommerce. The conference provides its attendees not only with the opportunity to listen to the world’s most successful people in the business, who will share their success stories and methodologies; but it also provides attendees with the opportunity to partake in various workshops alongside some of the world’s most successful companies, engaging directly with the speakers and representatives. eCOM360 attendees will be able to gain more insight by communicating directly with these digital gurus, asking questions and learning from their valuable experiences and know-how.